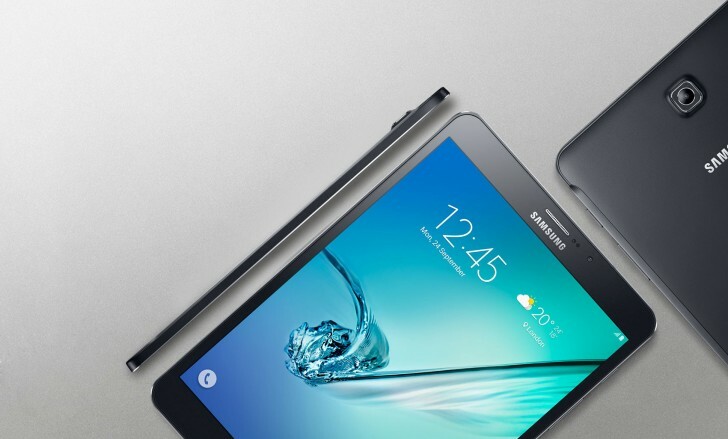 Samsung covertly launched tweaked versions of its Galaxy Tab S2 tablets, these moving to the Snapdragon 652 chipset. Both tablets will launch with Android 6.0 Marshmallow (the original started with Android 5.0). Both have Super AMOLED screens with an iPad-like 1536 x 2048px resolution, 8MP/1440p cameras and Samsung is selling keyboards if you want a more productive experience. Anyway, the Galaxy Tab S2 9.7 is priced at €550 and you get LTE connectivity and 32GB storage. The Tab S2 8.0 tablet starts at €450 for the Wi-Fi only version (32GB) and goes up to €480 if you want LTE. Those are the German prices, presumably availability will expand across the rest of the EU soon. A couple of months ago those were spotted in benchmarks and reported as the Galaxy Tab S3, but it seems that Samsung didn't deem the changes important enough to bump the version number.